When I signed up for October Unprocessed, I started thinking about what changes we would make in our home. After analyzing our eating habits I didn’t want to make any changes to our diet as 85% of our meals fall in the unprocessed category of no white flour, no white sugar/HFCS, no soy derivatives, no frozen, packaged dinners, no cereal, and no protein bars/drinks/shakes category. The other 15% we are free to anything from the “no” list because I believe moderation is the best way to go and often you have no control over what you are being fed. Instead I took the October Unprocessed Challenge to communicate the “whys” of eating an unprocessed diet to my kids as it relates to their bodies and their understanding of real food (well at least to my 4-year-old, my 18 month old just goes “geeee!” to everything I say to him). In the process I realized that what I was striving to teach my kids is also applicable to most adults as we have forgotten the basics of why we need to eat certain things. Breakfast is the most important meal. My 4-year-old knows that she doesn’t leave home without breakfast in the morning since she hasn’t eaten since bedtime which could be more than 10 hours ago. I have also discussed with her that breakfast needs to be a combination of protein, carbohydrate and fruit or veggie. I am also slowly building the blocks of what sources of carbohydrates are, what sources of protein are etc. All her 4-year-old mind knows is that breakfast gives her the energy to learn well in school, to have fun at school, and not be cranky at school. I also make more savory dishes than sweet for breakfast to avoid the sugar rush and subsequent sugar crash. As an adult do you eat breakfast everyday? Introduce them to fruits and veggies. Living in Los Angeles, we have access to a plethora of farmer’s markets and ethnic grocery stores. Anytime we are at a store or a farmer’s market, I introduce new fruits or veggies and buy a few pieces so we can taste it at home. When was the last time you tried a new fruit or vegetable? I know I fall into the rut of eating my favorite fruits and veggies. I sometimes wonder if it weren’t for my kids and my desire to be a good role model, would I be as willing to try new fruits and veggies. Introduce them to Vitamins and Minerals. While introducing the kids to fruits, veggies, nuts, and grains, I tell them what it does to their body. This applies to both good and bad foods. The discussion generally goes like this – “Broccoli gives you calcium, and calcium gives you strong bones and makes you strong” or “Spinach gives you vitamin A and it keeps your eyes healthy”. Must know how to cook. In order to promote this lifelong love of real food one has to teach the kids to cook. I hope that my kids have a repertoire of 10-15 dishes they can whip up in no time by the time they go to college. Knowing how to cook is one of the basic life skills that every kid must know because it is only when they know how to cook they can break away from the processed food reality around them. 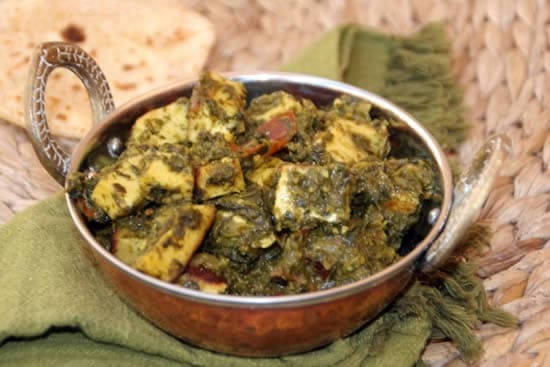 Let me introduce you to one of our family favorite recipes – Kale/Spinach Paneer or Saag Paneer. This is a nutrient dense recipe and my kids really do love this recipe! (I swear!). Paneer is Indian cheese that is made from adding acid to milk and curdling it. You can buy it from Indian Store or major grocery stores, but making it at home is a breeze. Check here for a video on how to make homemade paneer. You can easily substitute chicken or tofu for the paneer. Cut the paneer into cubes and pan fry them with no oil on low heat till the side has browned. Flip and brown the other side also. Or you could broil the paneer in a toaster oven until they are brown on both sides. Alternatively, you could fry the cubed paneer in oil until all the sides are brown. Keep aside. Add 1 Tbsp of oil in a wok or a pan on medium heat. Toss in both the kale and spinach leaves and sauté them till they are wilted. Remove from the pan. Purée the wilted kale and spinach leaves in a blender to a paste. Add 1 Tbsp of oil to the wok/pan used previously (or a new pan) and toss in the onion and garlic. Sauté over medium heat until the onions are translucent. Add the kale/spinach purée, turmeric, coriander powder, and salt to taste. Sauté until the leaves turn dark green, about 4-5 minutes. Add the tomatoes and cook for 3-4 minutes until the tomatoes are wilted. Add the browned paneer and water, and simmer for 5 minutes. Serve with rice, quinoa, or Indian bread (Naan, Roti, Paratha)! Rashmi Nigam is a wife, mother, foodie, and blogger who chronicles her journey towards raising adventurous healthy eaters at YumKid. She draws inspiration for her kid-friendly recipes from her real food upbringing as well as her travels, and she shares her tips to prepare simple, unprocessed meals for her family. You can also find her on Twitter, Facebook, Pinterest, and YouTube. That looks amazing! Something totally out of my ballpark, can;t wait to try it! Thanks Rashmi! I’m so making this! Healthy, delicious and a comfort food! Breakfast – I have breakfast most days, although it’s usually something small – a banana or some yoghurt with a swirl of jam/honey. New fruit – I tried figs for the first time this week. Vitamins – I know some vitamin sources. However I know that if I have a good mixture of colours on my plate, I can be fairly sure I have a good mixture of vitamins in there. Yum! Although my first attempt at a homemade paneer was rather crumbly, our tastebuds didn’t mind! Thanks for the simple recipe (and the addition of kale) for one of my favourite dishes! I learned many important things here. Your paneer is unique, most of likely recipes are not dried as this. I’m sure this will also give a different taste.